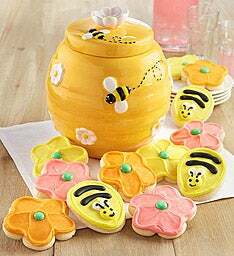 Our high quality ceramic cookie jar is the perfect keepsake gift for special friends and family. 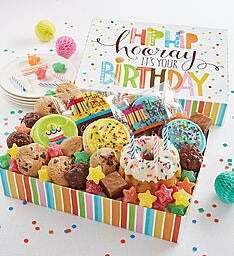 The perfect birthday combination – our gluten free cookies and brownies delivered in cheerful birthday boxes. *Prices and Discounts for Cheryl's Clubs are exclusive of applicable shipping charges and taxes. The payment method used for today's order will be charged for each future ship date. This item is not eligible for free shipping or additional discounts. 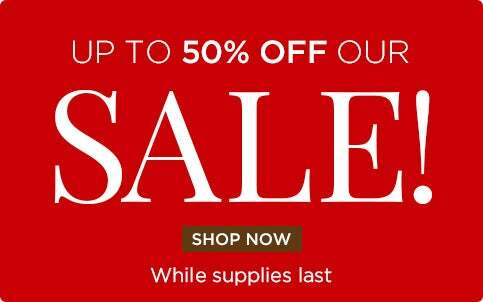 Items may vary and are subject to availability, delivery rules and times. 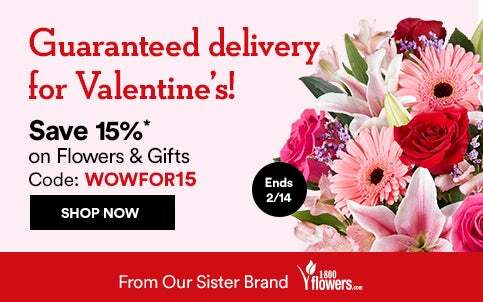 Offer not valid on in-store purchases, previous purchases, orders submitted through the Business Gift Service Department and/or logo customized product. 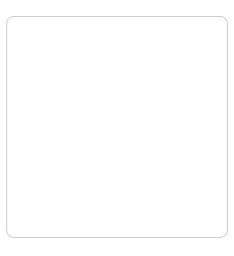 Offers cannot be combined with any other order level promotions, are not available on all products and are subject to restrictions and limitations. Offer valid through 11:59 PM EST 12.31.17. Prices and charges are subject to change without notice. Void where prohibited. © 2016 Cheryl & Co.
For over 30 years, Cheryl's gourmet cookies and desserts, especially our famous buttercream cookies have been great to share with family and friends. With easy cookie delivery across the United States, no matter where your friends, family, or business partners may live, it's easy to send cookie gifts to deliver a smile. 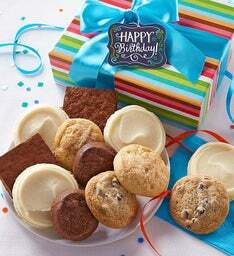 We offer a wide range of exclusively designed cookie gifts and gift baskets. Perfect for any season, or any occasion including birthdays, anniversaries, Valentine's Day, Mother's Day, Christmas and Hanukkah. You'll find cookies online for any sentiment you wish to express — Thank You, Get Well, Best Wishes, Thinking of You, and Just Because. 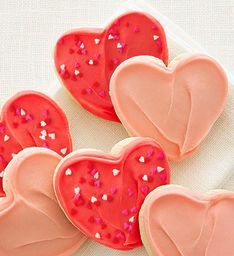 Along with our famous $5 cookie card , we have an amazing variety of different types of cookies; oatmeal raisin cookies, frosted buttercream hearts cookies, mint chocolate chip cookies, peanut butter cookies, white macadamia chip cookies, chocolate chocolate chip cookies, lemon burst cookies, frosted chocolate caramel pecan cookies, frosted pumpkins cookies, and snickerdoodle cookies. 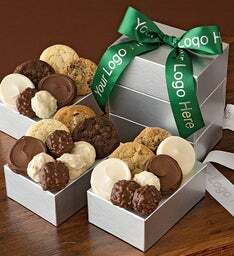 Cookies are baked fresh; we guarantee the quality, freshness, and presentation of our gifts. If you're not 100% satisfied, we'll do what it takes to make it right. 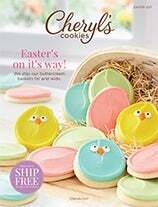 Explore the Cheryl's website and find your favorite and start creating your own cookie recipes. To enhance your experience on our sites, many of our web pages use "cookies". Cookies are small text files that we place in your computer's browser to store your preferences. Cookies, by themselves, do not tell us your email address or other personal information unless you choose to provide this information to us by, for example, registering at one of our sites. Once you choose to provide a web form with personal information, this information may be linked to the data stored in the cookie. A cookie is like an identification card. It is unique to your computer and can only be read by the server that gave it to you. Enable cookies on my browser? Microsoft Internet Explorer 6.0/7.0 - Select Tools -> Internet Options, and then click on the Privacy tab. Move the slider to select the Medium setting. Or, click Advanced... button, click "Override automatic cookie handling", and click "Always allow session cookies". Mozilla FireFox 1.0 - Click Tools, and then select Options. In the Options window, select the Privacy icon on the left. Click on the + sign next to cookies to expand the option.